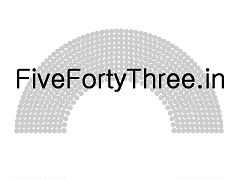 FiveFortyThree aims, through rigorous statistical analysis, to predict the 2014 General Election results for the 16th Lok Sabha in India. Our aim will be to predict the outcomes for each of the 543 parliamentary constituencies. Our statistical team of NRIs will remain apolitical. As amateur poll aggregators, we wish to see whether a system can be developed, similar to those performed for elections in other countries, for predicting the General Election winners. a) Pollster accuracy from previous general elections (1999-2009). This data will be used to present a pollster rating. Our database includes details for AC Nielson, GFK Mode, C-Voter, MDRA, TNS and CSDS. b) All candidate results from 1998 to 2009. This includes the voter turnout and winner details for each election. This database has also taken into account delimitation. Consequently, some predictions have been made for newly named constituencies on likely winners in older elections, based on the Vidhan Sabha constituencies. We will also look at surveys conducted on political opinions and attitudes to determine whether these have any predictive abilities in voter decisions. There are several methodologies that can be taken to perform our predictive analysis. Some of the more famous ones include those of Nate Silver and The Princeton Election Consortium. As we develop our methodology, we will present it on this blog. One of the fundamental differences to account for in our analysis, compared to other countries such as the USA, is in the fact that India has a multiparty system. Also, governments are typically formed through alliances. The political jostling that occurs post-election can be difficult to account for, so our aim will be to predict the outcomes for each of the 543 constituencies and then present scenarios for the most likely alliances.